Following a year of development of the earlier prototype GT model by Jota Design, Mazda has given the go ahead for a limited run of production variants to be made available to the public. The high performance GT model is based on the 2.0 six speed Sport Tech Coupe grade with post registration modifications carried out by Jota. 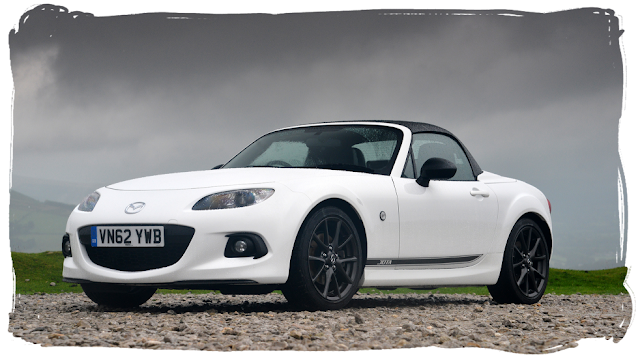 The car is due to launch on 1st March 2014 priced at £30,000 and is only available from Jota and the Lodge Mazda dealership, making it a worldwide UK exclusive. The car has been developed by Jota Sport – the Le Mans specialists responsible for preparing Mazda’s factory-backed MX-5 British GT race cars. They have managed to boost the power of the UK's 2.0 LF-VE MZR engine from 160Bhp to just over 200Bhp. 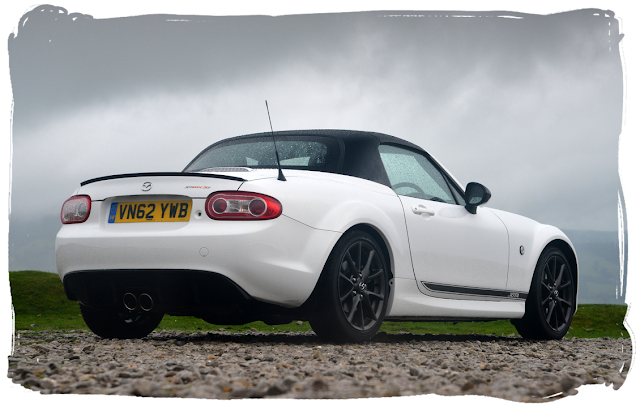 This has been achieved through engine remapping and a revised exhaust system featuring dual centre exit tailpipes. The increase in power shaves 1.5 seconds from the car's 0-60mph sprint time which is now achieved in 6.4 seconds. The car will then carry on to a limited top speed of 140mph. The GT is available in a choice of three colours: Aluminium Silver, Crystal White Pearl, and True Red. Like several other coupe editions it features contrasting Brilliant Black retractable hardtop and door mirrors, and dark anthracite 17" alloy wheels. The centre exit exhaust (previously seen on the Open Race cars) is surrounded by a carbon fibre diffuser, and there are exclusive Jota racing stripes along each side of the car. Handling is further improved from standard with tweaked Bilstein suspension and a lower ride height. The interior spec is standard Sport Tech so includes the Bose 7-speaker audio system with Bluetooth and also adds the black leather & alcantara Recaro seats, Jota carpet mats, and a Jota badge between the seats with the car's build number on. 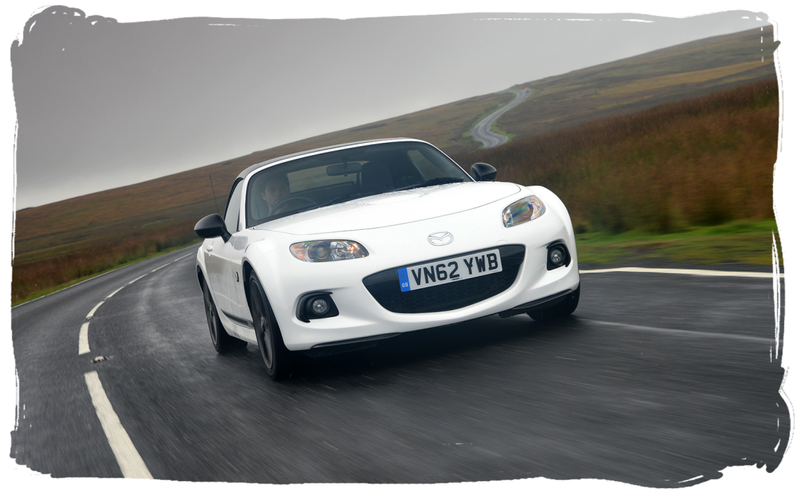 GT owners will be able to choose some exclusive optional parts not available on other MX-5 models. These include carbon fibre front and rear spoilers and specially developed Öhlins suspension. Despite the changes to the engine, fuel consumption is not significantly reduced and service intervals remain the same as the regular car. Mazda will provide after sales support through the dealer network and the car will keep the 3 year standard warranty for non-modified parts with an aftermarket warranty extension to cover the modifications. 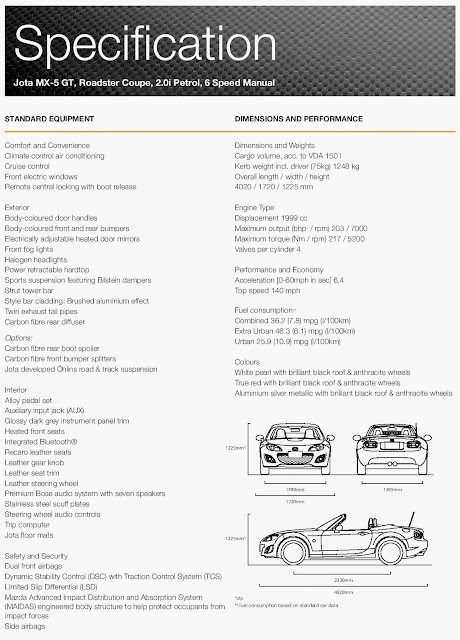 You can view the spec sheet of this genuinely special edition below, and further details on the website mx5gt.com - sadly now defunct. UPDATE: Lodge have updated their website offering a version of the Sport Tech Coupe based Recaro model. These additional cars appear to have been destined for Jota GT conversion but were left unsold due to limited demand. They are now being offered without the engine modifications or the Jota branding, but do include the Recaro seats and a graphic stripe. The cars are available in Crystal White Pearl, True Red, and Aluminium Silver, all with the black retractable hardtop, black mirrors and black alloy wheels. You can read more here.